People know about MP3 files, and they may think MP3 file contains the best audio quality. In fact, there’re other audio file formats which provides higher audio quality. FLAC file is the same as MP3 audio but the quality of this file is greater than MP3 audio files. If you are also the one who is looking to convert MP3 to FLAC then you can follow this easy step by step tutorial and know about how to convert files using MP3 to FLAC converter. KeepVid Online Video Converter is a free online website to convert files using browser directly. This website converts your videos online and provides you several options to download the converted files after finishing the download process. People can upload the video to the website directly and convert it within short time. 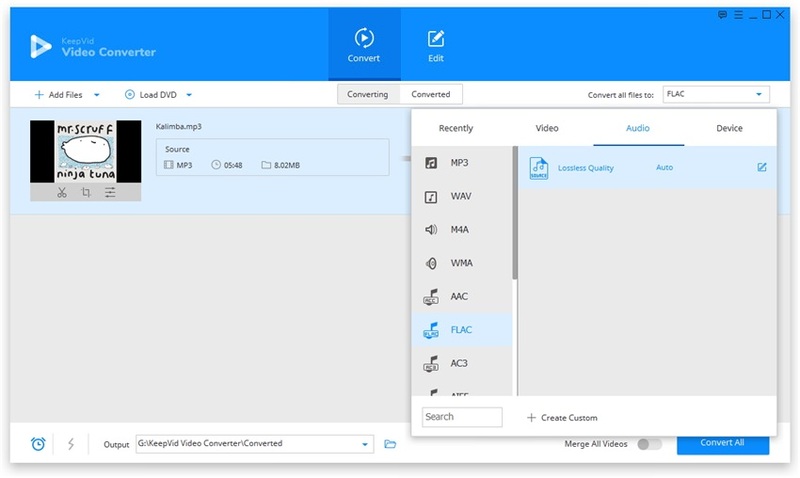 KeepVid online video converter supports 50 audio and video formats so you can easily convert the files in other formats as well. Of course, you're also allowed to convert FLAC to MP3 with the help of KeepVid video converter solutions, and you can convert most of the popular video and audio formats with this converter. 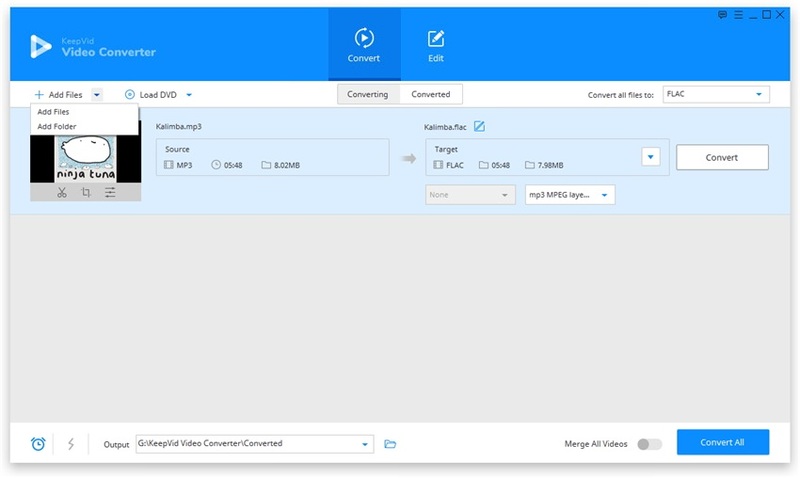 KeepVid Video Converter offers you many options for converting video and audio files, and it also enables you to download videos from the video sharing sites. This software is fully compatible with Windows and Mac computers, and it supports the latest Windows 10 operating system. KeepVid Video Converter is easy-to-use program with options of converting, editing and downloading videos. Convert MP3 to FLAC and other 1000+ video and audio formats. The conversion speed of this program is 30x faster than any other converter. Convert videos for your devices, including Android, iOS and so on. Step 1. Start KeepVid Video Converter and add MP3 file from your computer. Step 2. Choose M4R as an output, and click the Convert button. Step 3. 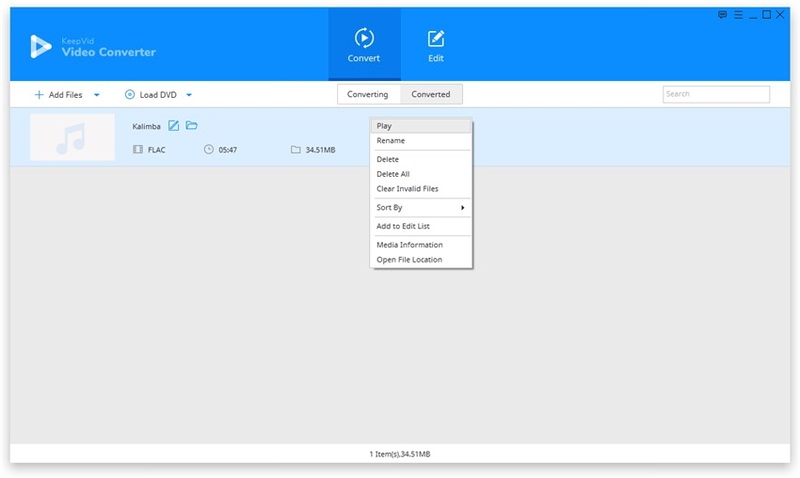 When the conversion finishes, you can go to the Converted tab and find your converted file. Download and install KeepVid Video Converter on your computer, and then start it. Then select the Convert section at the top middle of the main interface. Click the Add File or Add Folder button at the upper left corner to add MP3 files from your computer. You can also drag and drop the MP3 files into the program window. Now you can click the inverted triangle at the right side of the Target area, and select FLAC as an output in the pop-up dialog. Or you can click the inverted triangle icon beside the Convert all files to button, and select FLAC as output in the pop-up window. After that, click Convert or Convert All button to start converting MP3 to FLAC files. KeepVid Video Converter will show you the process of the conversion. When the conversion finishes, you can get the converted files in the Converted tab. Or you can right-click the converted file and choose Open File Location to find the video in your computer. FLAC full name is Free Lossless Audio Codec and it is an audio format same as MP3 format. This format can compress your audio files but without losing the original quality. This format works just like a zip file but it is only designed for the audio not video. You can easily play the compressed FLAC files on any of your favorite player. The latest version of this format is FLAC 1.3.2 and it was released on 1 January 2017.